Paul Nelson is the real deal. The owner and operator of Stronghold Functional Training might just be the friendliest bloke I’ve met, but don’t let his personable nature fool you, he has 30 years of training and experience under his belt. After 12 years of Tactical Response Policing, Paul made the decision to become a personal trainer with the aim to make a bigger impact on the community by working closely with people to improve their strength, fitness and confidence. 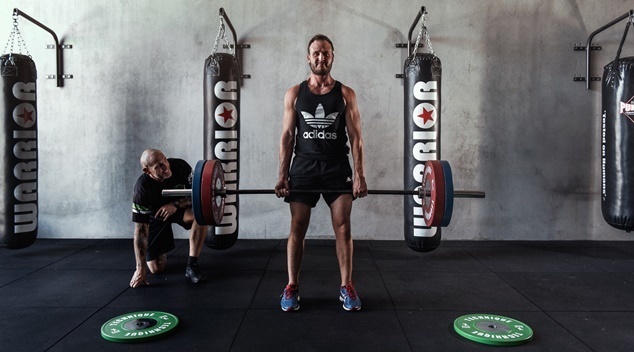 Paul is more than equipped with the skills to help his clients get results with experience in bodybuilding, power lifting, Muay Thai, boxing and even AFL, but what sets him apart from the pack is his genuine passion for empowering his clients, both mentally and physically. Paul offers tailored one-on-one personal training sessions, small group strength and cardio (HIIT) group training classes and fight for fitness classes to teach his clients how to defend themselves whilst improving their fitness. He uses traditional training methods such as barbells and dumbbells, combined with more modern types of fitness methods, think kettlebells, sleds, battle ropes, as well as some creative ways to workout out with your body weight. The benefits? Well, free-weight and body weight training keeps our posture in check, and our bones and joints strong. Most importantly traditional movement strength training such as squatting and lifting will help you build a strong core more than any other fitness methods. Paul’s gym boasts a friendly environment and community type culture that has you feeling welcome from the moment you walk through the front doors. The gym is accessible to all fitness levels, and is top of my list for anyone looking for a trainer or team training gym in the northern suburbs. Paul’s two loveable (and rather large) pooches are part of the gym family with their only little space in the back corner. Go say hello to them while you’re there. Stronghold Functional Training SHFT is located at 2/28 Canham Way, Greenwood. Find more information on Facebook. Beau is the founder of ONE Fitness Health Lifestyle in Subiaco.